Many of us are aware that certain foods we love are poisonous foods as far as our pets are concerned. Many of us have heard that chocolate is bad for our pets but this is only one of the many different regular human foods that are potentially harmful to our dogs. But do you know why it is bad for your pet in the first place, or, how much of a certain substance is bad for your German Shepherd? Dog owners should not assume that human food is always safe for our pets. In fact, in many cases just the opposite is true. So it is very important for us as dog owners not only that we know which foods are potentially harmful to our pets but also, why these foods are harmful and what to do in the event of ingestion of any of these potentially poisonous foods. For your information we will list and describe (in some detail) what many common poisonous foods to our pets are that we have around us daily and offer many more details as to how these foods affect your pets in the first place. Onions and garlic both contain the toxic ingredient thiosulphate. Of the two, however, onions are the most dangerous. The chemical thiosulphate can cause potentially fatal hemolytic (or heinz factor) anemia in dogs and cats. This results in the pet's red blood cells bursting while actually circulating throughout its body. Onion poisoning can occur with only one single ingestion of a large quantity of onion laced foods or with repeated meals containing small amounts of onion. It seems that garlic is less toxic overall and larger amounts of garlic would need to be eaten to cause illness. Many holistic veterinarians often recommend small amounts of garlic for pets. But more than one small clove of garlic per 20 pounds of body weight per day, or regular doses of onions in any amount per day, can cause circulating red blood cells to burst. Any form of onion could potentially be a problem including: cooked onions and table scraps containing cooked onions, dehydrated onions, raw onions, and/or garlic. Pets affected by onion poisoning show gastroenteritis (with vomiting and diarrhea). Later on they will become breathless because the red blood cells that carry oxygen through the body are less in number. The best thing a German Shepherd puppy owner can do to reduce risk of poisoning from any of these poisonous foods is to keep these foods away from your pets in all it's forms in the first place. The toxic compound in macadamia nuts is unknown but it is known that dogs have been affected by eating as few as six macadamia nuts, while others had eaten closer to thirty or forty. Macadamia butter has a similar effect on pets. What happens when your dogs eat macadamia nuts? How is the dog affected exactly? Affected dogs will exhibit fine motor control difficulties such as muscle tremors and weakness or even paralysis in the hindquarters as well as swollen limbs or pain when their limbs are manipulated. Additionally, affected dogs have problems getting up and about and pant, often heavily. There is an up side to this poisonous foods in dogs. Dogs reported as having eaten macademia nuts and exhibiting symptoms seem to recover from the toxicity over time. Even so, it is our best advise for to visit your veterinarian if this should ever happen to your GSD and to keep macademia nuts out of your pets reach in all cases. Theobromine and caffeine are the active ingredients in chocolate that are dangerous to dogs and other animals. Theobromine is both a cardiac stimulant and a diuretic. Due to the diuretic effect of theobromine your pet may pass large volumes of urine. Additionally your pet will be unusually thirsty. Vomiting and diarrhea are also common in cases of chocolate poisoning. The other effect of theobromine on your pets heart is by far the most dangerous. Two things may potentially happen - it will either increase your dogs heart rate, or, it may cause your pet's heart to beat irregularly. Death is very possible, especially with exercise if either of these problems were to occur. The signs of sickness may not be seen for several hours after chocolate has been eaten by your pet. Death may occur within twenty-four hours after ingestion has taken place. It is important to know just how little chocolate it takes to poison your dog. As little as twenty ounces of milk chocolate or only two ounces of baking chocolate can easily poison a ten pound dog. Also included with these lines of poisonous foods are cocoa powder products, which along with cocoa bean mulch are also poisonous foods as far as your dogs are concerned. Cooking chocolates, semi-sweet chocolate, dark chocolate, and milk chocolate re all included - milk chocolate being the least dangerous form. Remember, the darker the chocolate, the more harmful it is to your German Shepherd puppy. 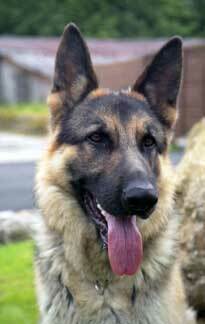 The best rule for German Shepherd owners and lovers is simple - keep all forms of chocolate away from your dogs. If your pet does swallow chocolate, don't wait to see what happens. Call your veterinarian or the ASPCA Animal Poison Control Center's emergency hotline (888-426-4435) immediately. It is always a good idea to keep your veterinarians phone number posted in an easy to find location in the event of a poisonous foods emergency - especially after normal business hours. If there is an emergency veterinary service nearby, keep that number handy as well. It is also a good idea to keep a First Aid Kit for Pets on hand for any emergencies that you may encounter. Better safe than sorry where your dogs health is concerned.